The Dashboard can be used to get a quick "snapshot" of the current, overall health and success of your business. 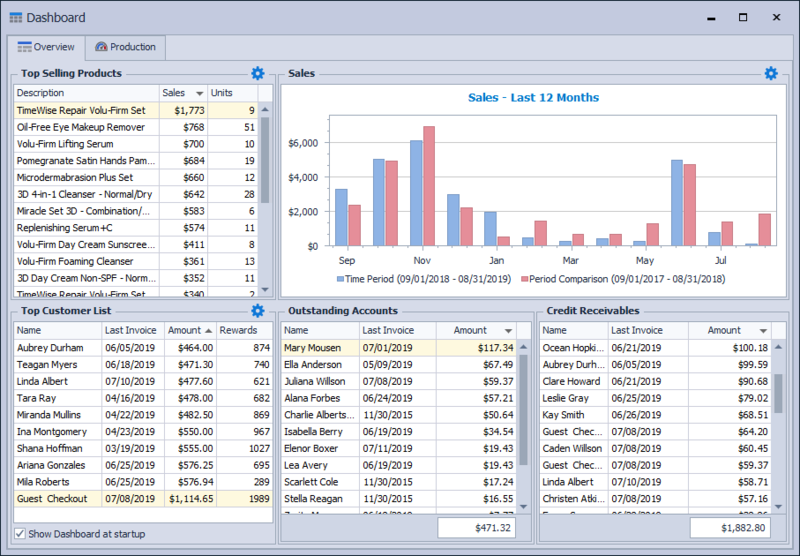 The top half of the Overview tab displays your Top Selling Products and a chart of your sales for the past 12 months. The bottom half displays your Top Customers, Outstanding Accounts and pending Credit Receivables which also include the date of their Last Invoice and the Amount. (Depending on the form, the amount column refers to either the lifetime purchase amount, amount owed, or amount to be charged.). 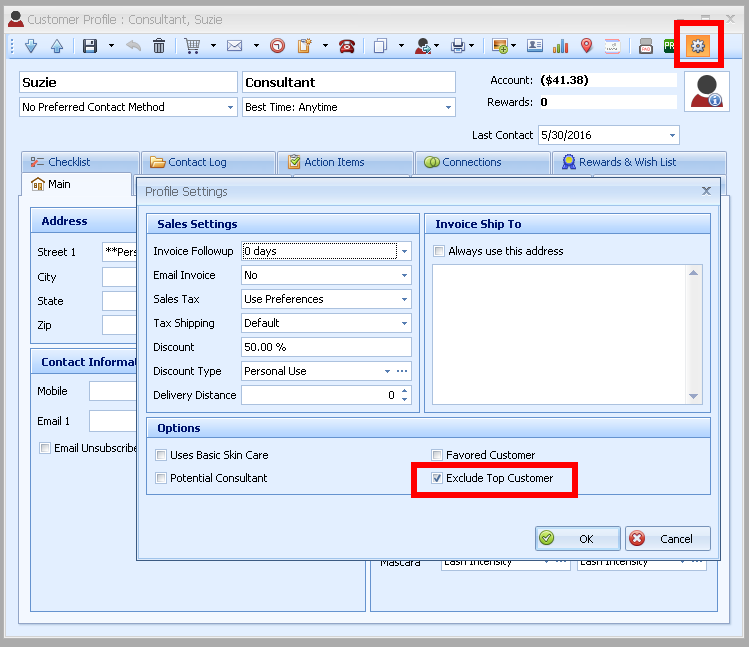 Double click on a customer name or product to open the corresponding profile. Choose how many Top Selling Products by clicking in that upper right corner of that section. by clicking in that upper right corner of that section. Select a check box from the consultants listed in the left-hand pane (or multiple for comparison). 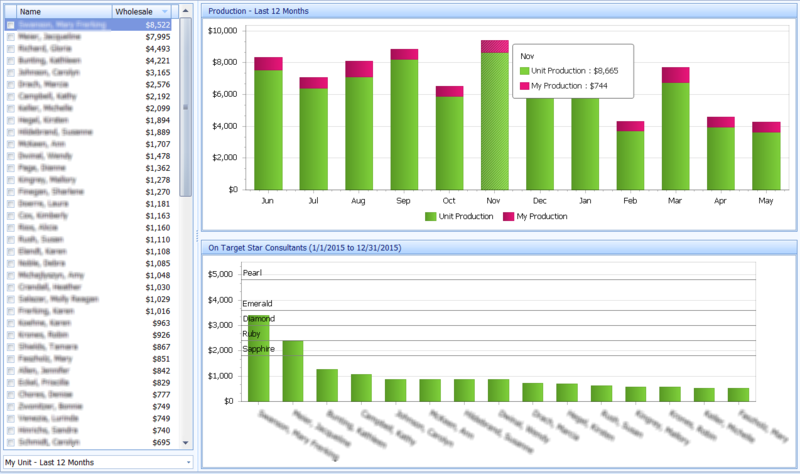 Applicable consultants will then be shown on the Production chart to the right. By default, the Production chart shows your unit and personal production from product orders entered (or imported) from the Inventory Orders form. The Star Consultant chart displays on-target consultants according to the criteria set from the drop-down menu.